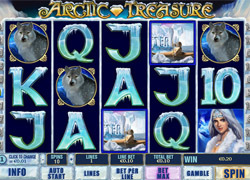 Arctic Treasure Slot is one of playtechs newer releases. This online slot has 5 reels with 20 paylines and added features of a Multiplier and Gamble. The Wild in this slot is the Ice Princess, Scatter is a man in a Kayak and Bonus is a Magical Crystal. Other graphic symbols are a Polar Bear, Wolf and Snowy Owl; the Wolf gives out an eerie howl when you hit big on a payline with it and the Snowy Owl gives a hoot for the same! The Wild substitutes for all symbols except the Bonus and Scatter. If 3 scatter symbols appear anywhere on the reels of this slot game, the player will receive 10 free spins with a triple multiplier! Free games can be won indefinitely in this feature making it more exciting! The Bonus symbol ( the purple diamond ) appearing on reels 1 and 5 pays a bonus game. Here you pick any 3 Crystals for cash prizes of different values and in this feature of the Arctic Treasure you can win up to 150 times your total bet! 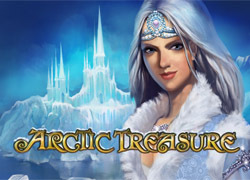 The Arctic Treasure online slots brings to mind the fairytale thriller by Hans Christian Andersen!